The Meridian Group and Rockefeller Group celebrated a major milestone Monday for The Boro, a new, mixed-use development in Tysons that will offer 4.2 million square feet of office, retail, residential and entertainment space. The developers held a “topping out” party for Boro Tower, a 437,000-square-foot, 20-story office tower that’s about halfway through construction. 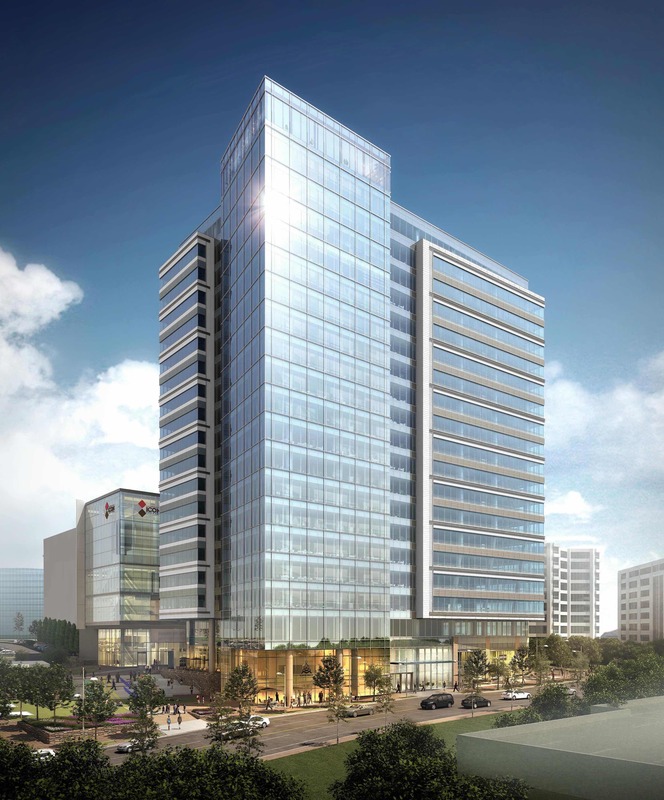 “To see Boro Tower at its full height, within the larger context of The Boro, is to see the future of work, living and lifestyle in Tysons,” Daniel Moore, president and CEO of Rockefeller Group, said in a statement. Meridian, based in Bethesda, Md., and Rockefeller Group, known for its development of the Rockefeller Center in New York, are co-developing the building, which offers panoramic views from the Blue Ridge Mountains to downtown Washington, D.C.
Skanska, which is building Boro Tower and a ShowPlace ICON theater, hosted the topping-out party, attended by more than 400 people, to recognize those helping to design and construct the buildings. “We’re more than halfway done completing this phase, and we wanted to thank all of those who have played an important role in our success so far,” said Jason Phillips, senior vice president of the Meridian Group, who is overseeing construction of The Boro. At full build-out, The Boro development plans to offer more than 1,500 residential units as well as 1.9 million square feet of office, 350,000 square feet of retail, 250,000 square feet of hotel space and the theater. • Boro Tower, an office building that already has attracted tenants, including Tegna, a media company that has preleased 46,200 square feet for its new headquarters; and Hogan Lovells, an international law firm has preleased 44,520 square feet. • ShowPlace ICON Theatre, which will open a new cinema with 14 screens and upscale dining options. • Boro Park, which will provide a performance stage, an interactive water feature, outdoor seating and a 1,100-square-foot retail kiosk. • A five-level, 1,200-space, below-grade parking garage that spans the entire block. Located on a 15-acre site within walking distance of the Greensboro Metro station, The Boro also has attracted a Whole Foods Market, which plans a 69,000-square-foot location there.